They are the receipts of life’s best and worst moments. They are the enablers of reminiscing, the voices of days past. They are memories, and for people with Alzheimer’s disease, they are lost. On Saturday, September 23rd, advocates and sufferers alike walked for those lost memories at the Walk to End Alzheimer’s. 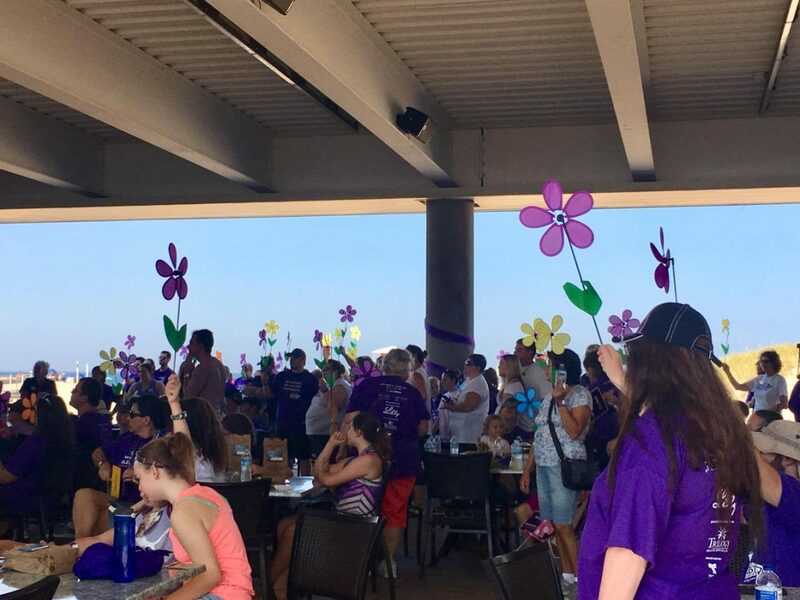 The walk, hosted by the Alzheimer’s Association, raises funds for Alzheimer’s disease research. The nearly 300 participants at Michigan City’s walk alone raised an estimated $45,000. One of the many struggles of the disease is that with no known cure, the quality of life for patients is determined by treatment of symptoms. For most sufferers, this means spending time in nursing homes, hospitals, or in the care of loved ones. These treatment options are expensive, however; the walk, whose funds are used in research for a cure, also allocates funds to help families and sufferers in treatment of the disease. “The majority of the funds raised here in Northwest Indiana support programs and services in our community. Seventy cents of every dollar raised is spent on our local programs and services. The remaining percentage is used to fund robust research efforts to advance treatment and find a cure for Alzheimer’s disease,” Stephanie Arévalo, development specialist for the Alzheimer’s Association, said. After months of fundraising, the dedicated supporters of the cause joined in Michigan City to celebrate their successes. With food, music, motivational speakers, and a walk along the sandy shore of Lake Michigan, the festivities concluded months spent fundraising. Among the participants were caretakers, family members, close friends, and dementia victims. Everyone present walked with a common purpose: finding a cure for an incurable disease. Sidney Leslie, LPHS senior, helped raise funds for the cause. With over $11,500, Leslie’s group, the Beach Bums, raised the most money for the Michigan City walk. “I walked for my great grandpa. He died in 2010. Toward the end there, it was really bad. He didn’t recognize us, and he didn’t talk. It’s hard because there isn’t a cure for it,” Leslie said. While some walked to support those already afflicted by the disease, others walked knowing that someone they love could one day be affected. Many walked for family, some for friends, and all for a cure. “I walk to raise money and awareness for a disease with no cure. I started out doing the walk in honor of my best friend, who was diagnosed [with dementia] at an extremely young age. I continue to walk in her honor, as well as in honor of my husband’s grandfather, who was diagnosed with Lewy Body, a form of dementia,” Pam Cook, walk participant, said. The disease affects millions of Americans each year. According to the Alzheimer’s Association, in the last 17 years, Alzheimer’s related deaths have increased by 89%. The form of dementia, typically affecting seniors age 60 and up, is unfair and uncaring. No measures can be taken early in life to guarantee safety from it. “Your family members don’t recognize you. Someone’s mom doesn’t recognize her kid, and that’s their mom. It’s an innocent disease. No one asks for it,” Leslie said. Alzheimer’s disease is more than just lost memories. It is also the loss of any sense of normalcy that a person and family may have. “Alzheimer’s disease… means that you develop problems with brain functioning, severe enough to affect daily life. So, a person with dementia loses the ability to do and complete everyday tasks that are very familiar, including things as basic as getting dressed, taking a shower, or making a sandwich,” Sarah Milligan, case consultant for the Alzheimer’s Association, said. The struggles that Alzheimer’s disease cause are rarely left for the victims to face alone. Family and friends often surround the sufferers, and those loved ones subsequently see the effect of the memory-stealing disease. “[My grandfather] may know who you are but doesn’t know your name. He has constant hallucinations and can lose his thoughts before he can even express them. He is confined in a chair, unable to walk, and being spoon fed by his wife due to his depth perception being off. It brings tears to my eyes at the thought of a loved one being robbed of their memories. It’s a horrible feeling to know someone for so long only for them to forget who you are and the memories you have shared,” Cook said. Even those who do not suffer from the disease- or know someone who does- should support the cause. As time progresses, more and more people are being afflicted by the disease. “Alzheimer’s disease affects everyone! Many are not caregivers or do not have a connection to the disease, but this disease is growing at an alarming rate,” Arévalo said. Though it hurts to love a sufferer, and it hurts to be a sufferer, advocates for a cure will not stop walking. To donate to the cause, find symptoms of the disease, or become an advocate, visit www.alz.org.